Characters have been stepping into movie screens since projectionist Buster Keaton jumped into a contrived mystery movie in Sherlock Jr. Woody Allen most lovingly utilized the convention in The Purple Rose of Cairo when Depression Era Mia Farrow and adventurer movie character Jeff Daniels took turns sharing the real world and the celluloid world with each other. Now, Todd Strauss-Schulson brings this concept to the horror genre in a hysterical spoof of the "dead teenagers" movies with a cast that those Friday the 13ths could only dream of. Teen Max (Taissa Farmiga, American Horror Story: Murder House and Coven) lost her mother (Malin Akerman, TV’s Trophy Wife) in a freak accident three years prior. Now on the anniversary of her mother's death, Max is forced by friends to attend a screening of a cult classic that her mother once starred in, Camp Bloodbath. 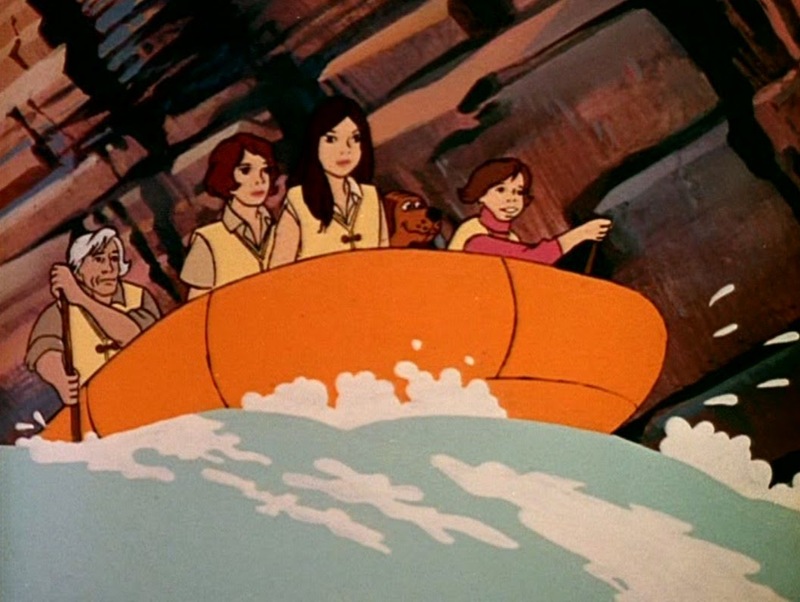 Due to a fire, Max and her friends escape though the screen but inexplicably land INSIDE the horror film. Max and her friends Duncan (Thomas Middleditch), Gertie (Alia Shawkat), Chris (Alexander Ludwig) and Vicki (Nina Dobrev) stumble around the familiar campgrounds, mingle with future victims with archetype personalities (nerd, tramp, man-whore) and come face-to-face with the heartless murderer, Billy Murphy, and his sharp machete. Wes Craven's Scream was revolutionary because for a change, the victims had seen horror movies, had grown up with the conventions, and were armed with survival tactics. But The Final Girls cunningly takes it to the next level. Max and the gang haven't just seen movies like the situation they're facing, they've seen THIS SPECIFIC FILM, over and over. They know where and when Billy will strike and how he will die. Unfortunately, their first plan, to force the counselors to not partake in sin and to hang with the final girl of Camp Bloodbath, a tough streetwise Paula who is supposed to eviscerate Billy with his own weapon, goes up in smoke, along with the alleged final girl. With Paula dead, all bets are off and our wily friends need to think of new maneuvers to end the invincible Billy. M.A. Fortin and Joshua John Miller's screenplay toys with conventions and both have obviously studied every nuance of the films they tribute (Miller has stakes in the horror genre as a child. He played the protagonist's son in Halloween III: Season of the Witch and the eternally youthful vampire in Near Dark). The modern day heroes are unprepared for movie tricks. They find their life repeating itself every 92 minutes (the length of Camp Bloodbath), they get trapped in a black/white world of flashbacks, and are even handicapped during a chase due to slow motion. The jokes told by the victims, particularly snarky Adam DeVine as the camp lothario, are appropriately lame, while the real world group observes and comments on the horror principles. Max and her friends see credits roll and hear the Harry Manfredini-inspired (stolen) Friday The 13th theme motif before Billy strikes. What makes The Final Girl so lasting is that the filmmakers refuse to go just for laughs. The script touches the heart in unexpected ways. Max is not only amongst characterless victims and a machine-like monster, she gets to spend time with Nancy, a shy country girl with a clipboard and a guitar who is supposed to die after losing her virginity to the camp stud. Nancy is not just a random fatality, she's the character Max's mother had played in the movie. Now Max gets a second chance to keep her mother safe even when her friends try to remind her Nancy is neither real nor actually her mother. Director Strauss-Schulson pays homage to all those so-bad-it's-good slice and dice movies like The Burning, Sleepaway Camp and the territory of Jason Voorhees. But he visually and thematically evokes memories of The Wizard of Oz. The camp’s outdoors are sprinkled with bright colored flowers and inviting forests where a girl just wants to leave a fantasy world to return home. Max, like Dorothy Gale, is an orphan. She takes her spiritual journey with a group of friends but in the end must lean on herself to succeed. Strauss-Schulson’s color schemes, mostly primary colors, are so extreme, they conjure up the films of Wes Anderson or the moodiness of David Lynch. Often, counselors wearing yellow will walk through red lit rooms with blue fog seeping in. The Technicolor world where Max has landed is so stylized it could only resemble Oz or the cartoon world of Walt Disney. The cast is pitch-perfect. 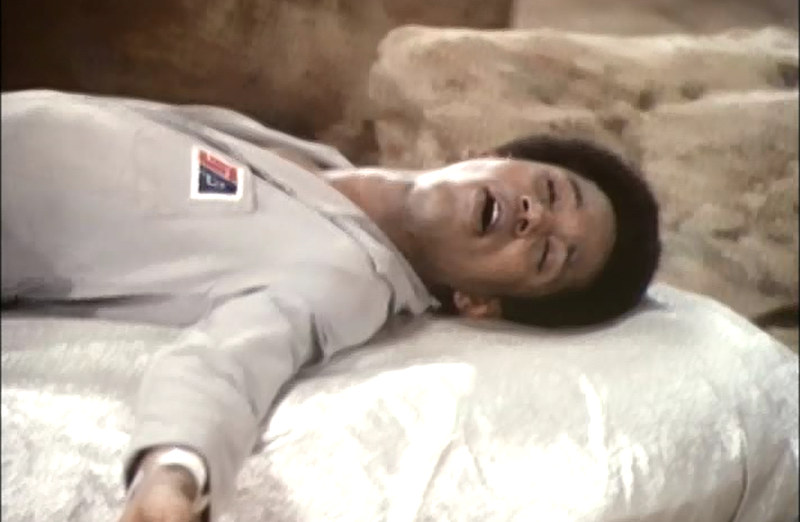 The Camp Bloodbath acting is wooden and trite, but performed by talented actors, like DeVine, who instead of winking at the audience, play the roles as they imagine amateur low budget actors would have in the '80s. Skawkat and Thomas Middleditch, who both come from cult TV comedies, Arrested Development and Silicon Valley, respectively, are adept at modern satire. Dobrev, also from TV in her first major role since leaving six seasons of Vampire Diaries, revels as the resident mean girl, but one self-aware that she's acting out and falling into the paradigm of a '80s horror movie victim. The film belongs to Farmiga and Akerman, though. Their chemistry is loving and supportive and makes the script shine. Farmiga, who always captures teenage angst such that audiences empathize with, grounds this zany film with earnestness and compassion. The Final Girls may not be as twisty as Cabin In the Woods or as laugh-a-minute as Shaun of the Dead, but the creators, avid slasher enthusiasts, have built a mousetrap that will delight fans as an homage and send-up to a most notorious genre. 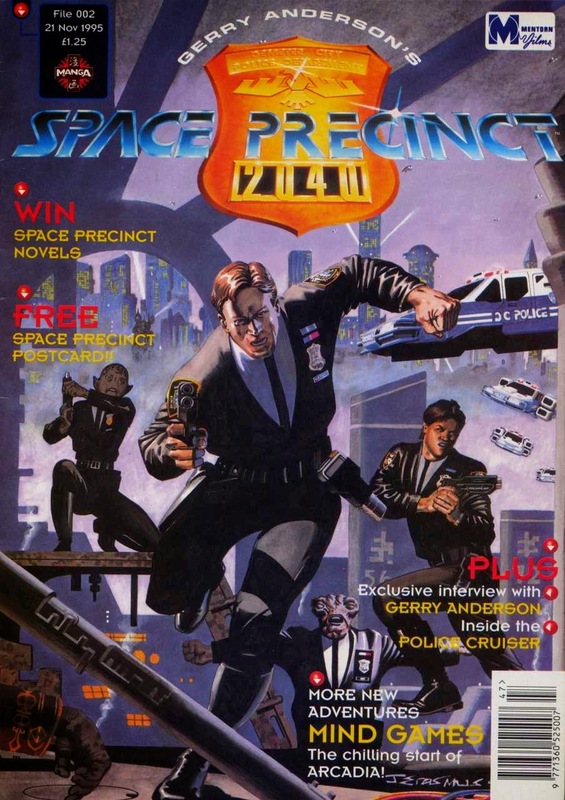 I remember with great anticipation the year of Space Precinct’s (1994 – 1995) arrival in syndication. 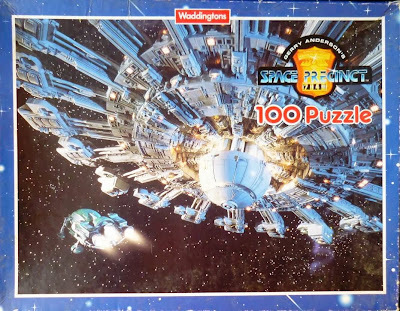 That was the span when I was completing my Exploring Space: 1999 book, and I was excited that creator Gerry Anderson finally had a new sci-fi TV series in the works, especially one with “space” in the title and as a primary setting. 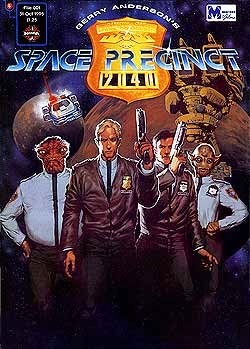 Unfortunately, here in North Carolina, Space Precinct only aired at 2:00 am on weekends and only sporadically at that. I think I ended up seeing two or three episodes in first run and feeling that -- much like Terrahawks (1983 – 1986) -- it wasn’t the greatest vehicle for Mr. Anderson’s talents. The series was released on DVD in America in 2010, and you can read my full review of the series here. I enjoyed it much more the second time around, especially the retro-style model-based special effects. It’s not a perfect sci-fi series, but it has a lot of fun moments. 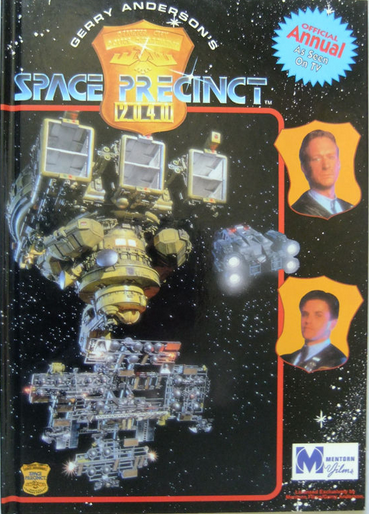 Although it was canceled after just one season, Space Precinct actually had its fair share of merchandise on the market. In my home office today, I still have several action figures from the series hanging on the wall, manufactured and distributed by Vivid Imaginations in England. In all, twelve small action figures were released, including the human characters Brogan (played by Ted Shackleford on the program) and bickering officers Haldane and Castle. 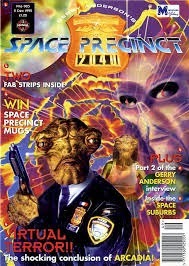 The alien police officers included in the line were Captain Podly, Officer Took, Officer Orrin and Sergeant Fredo. The precinct’s robot Slomo was also among the toys released, and is one of the few figures I don’t have. Each police action figure comes with a blue identification card, and accouterments such as hand-guns or scanners. The villains of the Space Precinct toy line were perhaps more colorful, including Snake and the grisly-looking Cyborg. Unlike the police action figures, these toys came with red ID cards and weapons including knives and rifles. The two toys from the line that I really wanted but never managed to get my hands on were the police bike, which I don’t believe was actually featured on the program itself, and the nifty police cruiser. 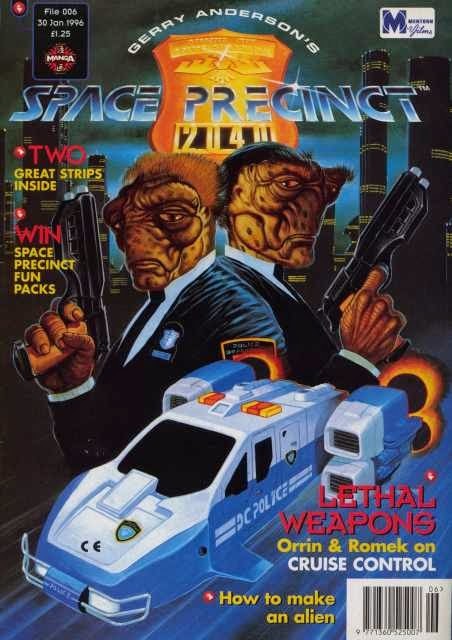 For me, the police cruiser vehicle was essentially the Eagle One of Space Precinct, a cool utilitarian design, and in some ways, the star of the show. It’s essentially a Blade Runner-esque flying patrol car with four engines. I still think it’s a pretty cool design, and I enjoy watching the series if for no other reason than to see it on patrol. 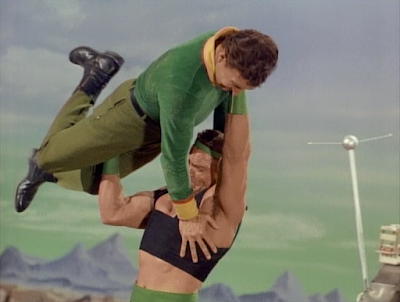 In “The Deadly Games of Gamma 6,” a group of warriors attack John Robinson (Guy Williams), but he defeats them in hand-to-hand combat. A fight promoter, Myko (Mike Kellin), sees his success and wants John to join the Gamma Games, televised throughout the galaxy. John refuses to fight, noting that primarily, he is a scientist. Will (Bill Mumy) is disappointed in him, in part because if Robinson fights, the family will be allowed to return to Earth. 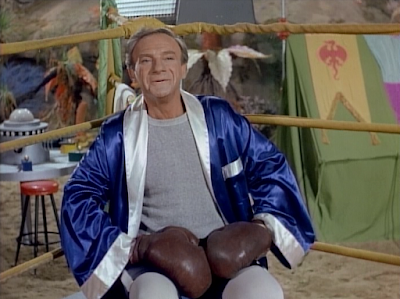 Smith (Jonathan Harris) seizes the opportunity to get homes, and agrees to fight a diminutive boxer, hoping he will be easy to defeat. Smith gets more than he bargained for, however, when he learns that the boxer can bilocate. And if Smith loses his contest, the Earth will be destroyed. 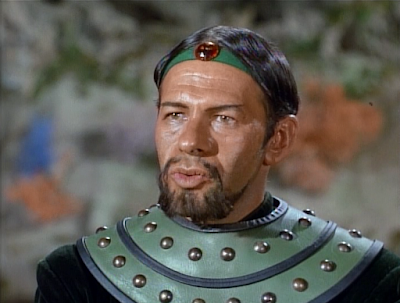 Finally, Robinson is convinced to fight, realizing all of the human race is at stake. There, as you may recall, a young alien (played by Kurt Russell) challenged Will in a fight, but the contest ultimately came down to Professor Robinson against the alien’s father, played by Michael Ansara. 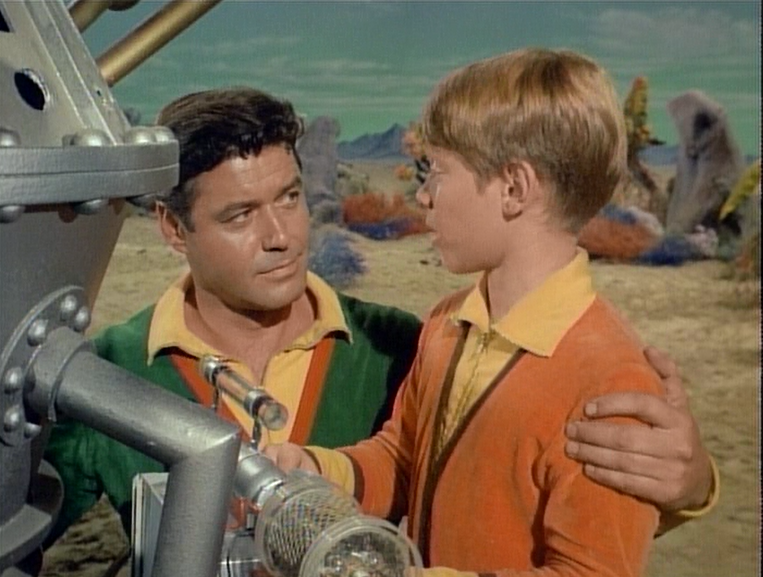 If the Robinsons won, in that case, however, they would be destroyed to spare the aliens any further embarrassment. 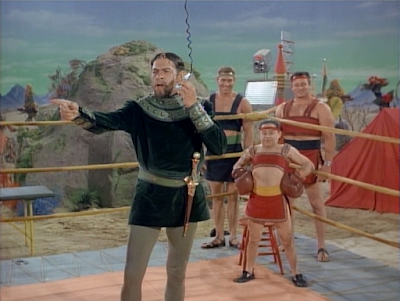 In this case, fighters come to the planet, challenge Robinson to participate, and threaten to destroy Earth if he refuses to fight. This quasi-remake also lingers on the idea of pride, and the relationships between father-and-son. In “The Challenge,” Will wanted to fight so as to feel worthy of John Robinson’s respect. In “The Deadly Games of Gamma 6” Robinson reflects that “Every son wants to feel his Dad is the greatest,” but still doesn’t want to fight. So thematically and even in terms of specific situations (alien beings spoiling for a fight), this episode is a retread. But here, I very much enjoy Robinson’s reluctance to fight. He is a family man and a man of science…a man of ideas. He is a role model and a leader, too, and in this case, being a fighter doesn’t really enhance him as a person. He wants to go to Alpha Centauri, anyway, not return home. So he doesn’t feel a sense of duty to fight, even though Smith and Will want him to. 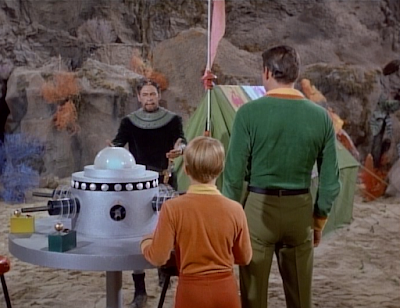 The second season of Lost in Space hasn’t been very good, but I feel it has struck a moderate level of quality with “Space Circus,” “The Prisoners of Space” and “The Android Machine.” Each of those stories had virtues, particularly the latter two. 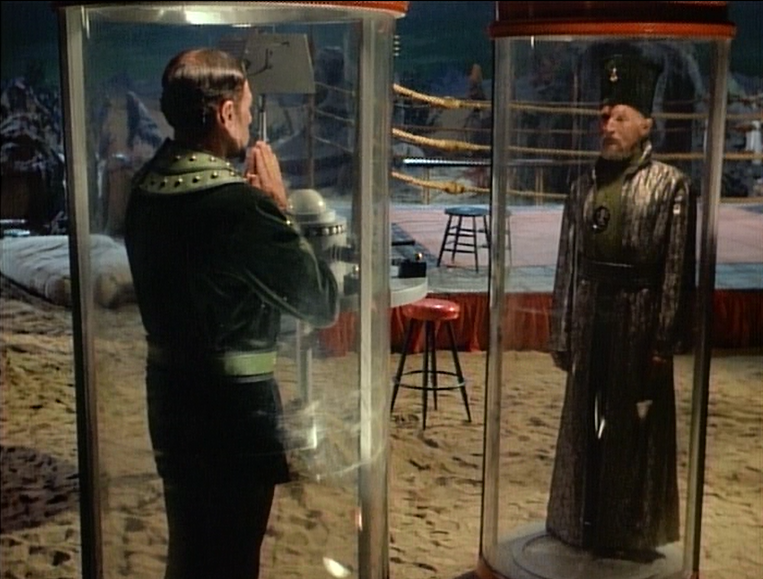 Also, I like the final battle featuring Robinson and Myko, a space-age version of Russian Roulette. It relies on wits and courage, rather than just physical strength, and therefore more befits a hero like John Robinson than a wrestling or boxing match. In this episode, Smith gets in over his head again, but I can’t really complain: that situation has become a primary mover of plots, and it’s useless for me to complain about it at this juncture. 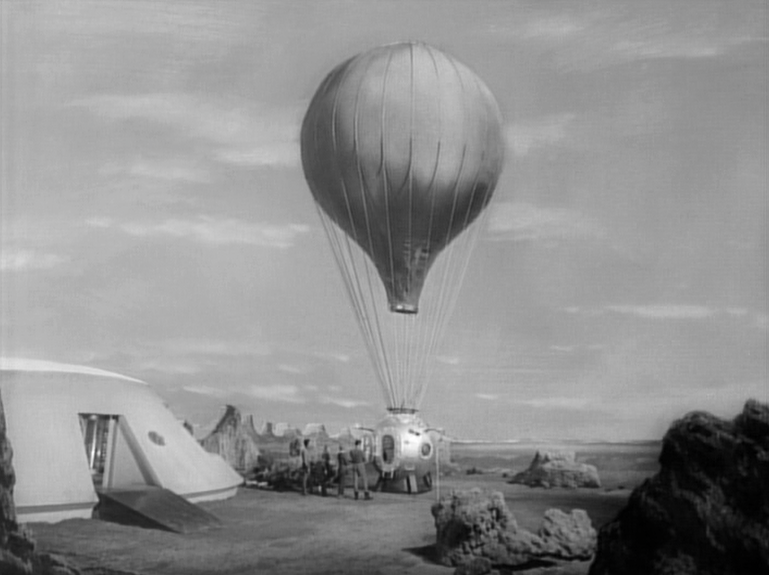 I can note that I prefer the first season’s approach to storytelling, in general, but Season Two is, broadly, about Smith getting the Robinsons into dangerous situations that they must then extricate him, and themselves, from. The biggest concern, as usual, for me in Lost in Space is the idea that the whole universe has this advanced, peaceful civilization -- with miners, circuses, hillbillies, traders, department stores, pirates, policemen and boxers -- and that Earth and the Robinsons can never be a part of it. No one ever reaches out a helping hand. But as one of the readers here on the blog noted a while back, perhaps there’s a prime directive in reverse working here. Maybe the galaxy isn’t allowed to help, even though it keeps interacting with the Robinsons. It’s a theory I would support, which helps make the series seem less inane, but there’s no commentary in the episodes that such a prime directive exists. The Black Cauldron (1985), an animated epic fantasy film from Walt Disney Studios, boasts a long-standing reputation as a box office bomb. Reports indicate that the movie cost 44 million dollars to produce, and it recouped well under half that amount. The movie -- very loosely based on Lloyd Alexander’s award-winning Chronicles of Prydain pentalogy -- was also the subject of protracted battles in the editing room. The first PG-rated Disney cartoon, The Black Cauldron was also denied a home video release for many years after its theatrical engagement. The source of the pre-release conflict? The original cut was deemed too violent and much too dark, and roughly twelve minutes were excised from the final cut. 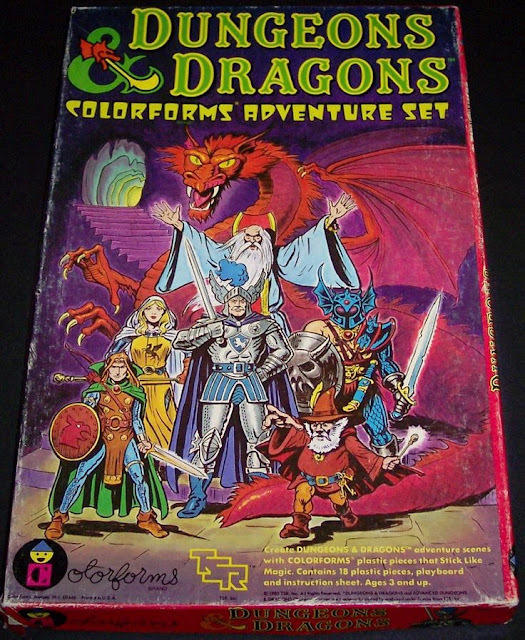 Much of the trimmed material involved the final battle, and the deaths of the Cauldron-Born, creatures who are, essentially, skeleton zombies. Studio executives were so concerned about the film's violence that its release date was pushed back from the Christmas season to the following summer. 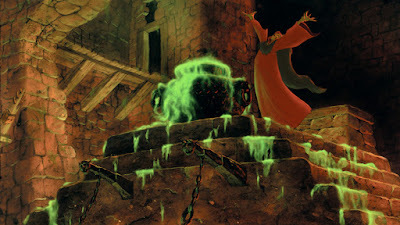 Today -- some thirty years after The Black Cauldron’s release -- it’s difficult to understand what all the fuss was about. This film hardly seems any more violent than any other fantasy film, animated or live action, of the 1980s. 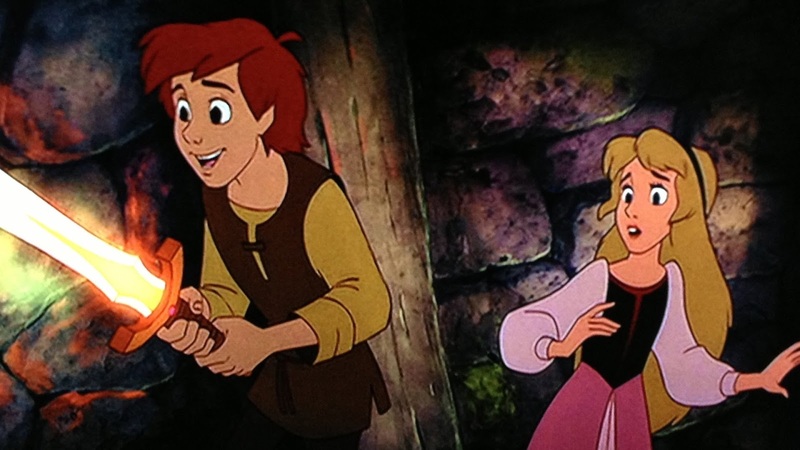 In fact, in 21st century terms The Black Cauldron now seems like, well, a typical child's movie. It's a little goofy, a little scary, a little emotional and never less than entertaining. 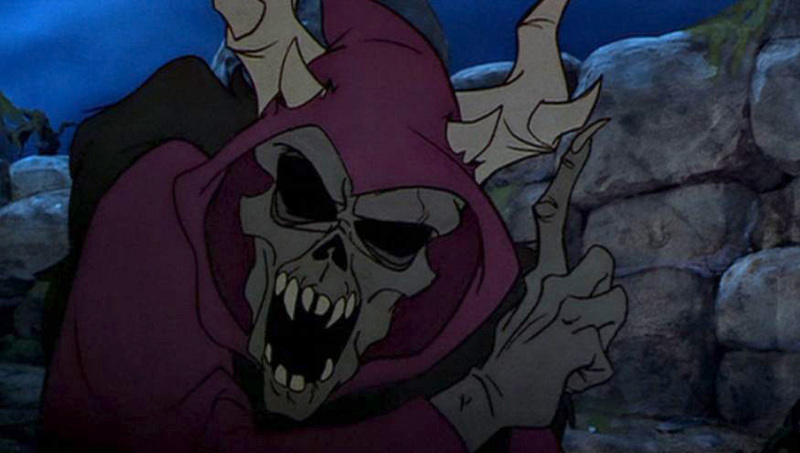 It’s a little strange to write about it in this fashion, but The Black Cauldron was for many years ahead of its time, and now, contrarily, perhaps time has finally caught up with it. Yet I believe it still carries relevant value as a work of art, however, because it pokes and prods at the very narrative structure it adopts. And what is that structure? Well, The Black Cauldron is an example of the Monomyth, or the heroic journey. And as I've written before, this is the standard (and oft-repeated) mode of the fantasy genre today. Often to the genre's detriment. But The Black Cauldron seems quite wary, or suspicious of the hero's journey paradigm, even as it apes it. And that embedded conflict signals a creative, imaginative and worthwhile way to tell this story. In other words, The Black Cauldron looks to be your standard issue hero's journey movie, very much in keeping with Star Wars (1977), The Dark Crystal (1982), or Krull (1983). Scratch the surface a bit, however, and one can see that the film is actually a critique -- or more accurately a rebuttal -- to this popular and pervasive story structure. A young assistant pig-keeper, Taran (Grant Bardlsey) dreams of being a great warrior, a great soldier who experiences untold adventures. In real life, his master, an elder named Dallben (Freddie Jones) takes care of a pig, Hen Wen, who has been gifted with the power of prophecy. When the pig foresees a future in which the Horned King sweeps across the land thanks to the Cauldron born -- an army of zombies -- it is decided that Taran must hide Hen Wen at a cottage on the edge of a forbidden forest. Unfortunately, the dragon minions of The Horned King capture the pig, leaving Taran to partner with a strange little creature, Gurgi (John Byner), a minstrel (Nigel Hawthorne) and a beautiful princess, Eilonwy (Susan Sheridan) to rescue the precious animal and gain possession of the mystical black cauldron before The Horned King can harness its power. Unfortunately, the cauldron is in possession of three sinister witches. "We never give anything away. We bargain. We trade." The Black Cauldron is indeed a hero's journey story. It focuses on a young hero who must answer the call to adventure when he hears it. Young Taran -- much like Luke Skywalker -- dreams of escaping a life of drudgery, and becoming a great hero or soldier. He actively fantasizes about that life, so much so that he can't focus on the present, or the chores before him. Instead he is called instead to his visions of majestic adulthood. At one point, Taran literally imagines himself as a knight in shining armor. Taran is aided on his quest in the film by a mentor (Dallben), and a motley band of friends like Gurgi, Fflewddur Fllam, Eilonwy, and Hen Wen. 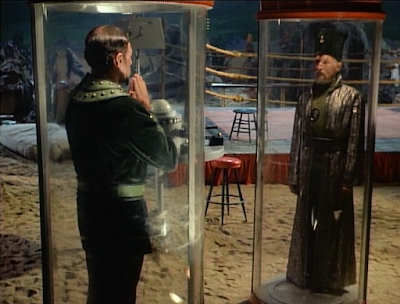 Not a one of them is particularly imposing, and yet they travel with Taran on his "road of trials," another crucial aspect of the Monomyth paradigm. Before the movie's end, they must defeat the villain and make the return home. As I've noted many times on the blog before, the Hero's Journey has been done to death. It's a 'universalist' concept used and re-used by many movies of the fantasy genre. Sometimes it can serve as a short-cut to thinking, or innovation, or even imagination. Yet The Black Cauldron provides an intriguing twist on the material. In the typical Monomyth structure, the young hero rises, succeeds on his trials, receives the ultimate boon (the achievement of the quest) and brings peace to his people or land. By contrast, The Black Cauldron doesn't appear to accept the idea that wars make for great heroes. Throughout the film, the screenplay pushes back hard against the very structure it utilizes. Taran is told, flat out, "war isn't a game. People get hurt." for example. His fantasies of being a great warrior are thus revealed for what they are: childish, juvenile, or unrealistic dreams. "Is the burning and killing still going on out there?" One character asks, caustically. War, such dialogue informs us, is not some romantic, rarefied thing in which destinies are forged and heroes rise. It is ugly. It hurts people. Later, Taran must make a (bad) deal with the three witches that costs him one object of his quest: his magic sword. Again, consider that Luke Skywalker doesn't have to give up his father's light saber in the first Star Wars. Colwyn doesn't trade his glaive to battle the Beast and save the world in Krull (1983). Yet to accomplish his "heroic" mission, Taran must forsake the very tool that traditionally, marks him as a hero, and allows him to win wars. He loses his weapon. He loses his ability to win a fight. But if you accept that war isn't a game, Taran's trade makes abundant sense. The film's climax follows that point rather explicitly. Taran is not allowed to die in a heroic sacrifice, nor win a victory with a weapon. Instead, a silly, unimposing little creature, Gurgi -- ostensibly the film's comic relief -- steps up and sacrifices his life instead. Thus Taran's quest is resolved through no traditionally heroic deed of his own. Instead, his ability to make a friend is the thing that saved his world from the Horned King. What he did right was not win a fight, but win a friend. 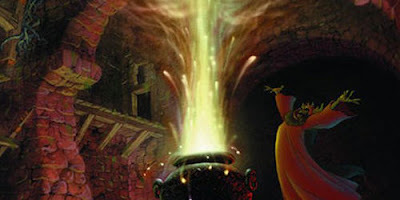 The antidote to evil, then, according to The Black Cauldron is not great strength, not battle training, and not combat. Instead, friendship is the key. People succeed against evil by making connections to one other. This idea, actually, is replayed (and replayed well, despite conventional wisdom) in The Phantom Menace (1999), a film that features a seemingly foolish creature like Gurgi (named Jar-Jar Binks), who also provides a key link in a "symbiotic circle" of his world. Without Gurgi (or the Gungans, actually) the heroes on their respective journeys cannot succeed. Taran is not a great hero in the traditional or stereotypical sense. He is not a great fighter, especially without the gimmick of his magic sword (which he trades away). He also is not a "Chosen One" with great inherent powers. Instead, a special pig has the power of second sight, or prophecy. The hero's special sight, in this case, has been transferred to livestock. These notions have always struck me as being very anti-hero's journey in a significant sense. In terms of villains, The Black Cauldron's most powerful moments arrive in the careful enunciation of a subtext about this fantasy world, and about real world history too. 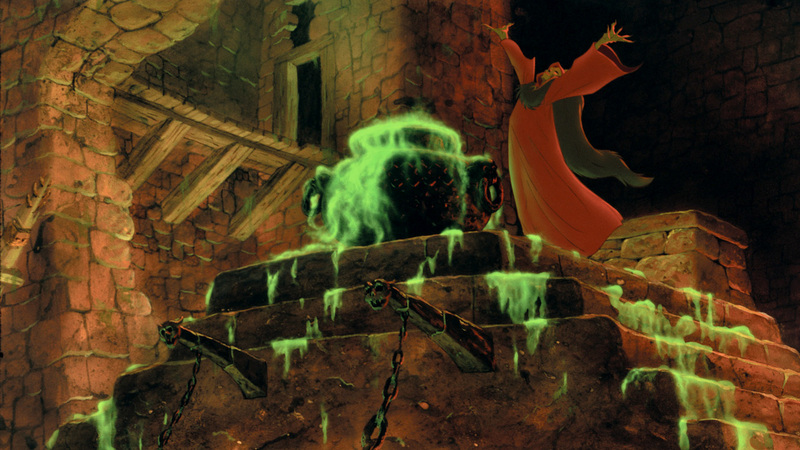 A cauldron is not just a metal pot, after all, but a situation characterized by “instability and strong emotions.” The world depicted in the Disney film qualifies as being an example of such instability. The movie reveals a world in which there seems to be no established force for good, and no functioning infrastructure to stop the sinister plans of The Horned King. Instead, this villain plans to use the cauldron, and revive the darkness of the past. The cauldron is the container that keeps alive the memory/soul of an evil king from that past. It is thus a repository for all the ingredients of mankind's history, ingredients that may yet endanger peace. So The Black Cauldron reminds us that the past is never really dead at all. Instead, it is always threatening to boil over, to spill into the present with dire consequences. Old conflicts and hatreds -- prejudice, nativism, violence -- don't seem to truly disappear, only to hide for awhile before bubbling to the surface once more. And the cauldron, we are explicitly informed, can never be destroyed; just like man's bloody past can never be truly expunged, either. We have to go on living with that cauldron, just as we have to go on living with the mistakes of the past. That’s not a bad motif for a fantasy film, and many of The Black Cauldron's stirring, dark visuals, aid in telling of a story in which unlikely heroes rise to quell a new threat to the present. As I noted above, the film also makes a powerful point about sacrifice. Here, a character who is not a great warrior -- nor even tall in stature -- saves the world out of friendship. The typical monommyth or hero's journey gives us a hero (often selected by destiny or fate) to "answer the call" to adventure. The Black Cauldron features a hero's quest, all right, but the hero succeeds not by fighting, not by battle, and not by killing. He thrives, instead, because of the friends he chooses to make. It's difficult to understand why Disney saw that as such a "dark" concept back in 1985. Friendship -- not war and strife -- says The Dark Cauldron, is the proper antidote to darkness. "As a huge fan of your blog/work, I have a particular request that I realize may seem a bit outside of your normal repertoire—if for no reason other than the fact it includes the words “Walt” and “Disney” near its title. But, if there is anyone who can properly deconstruct Disney’s The Black Cauldron, it might be you. 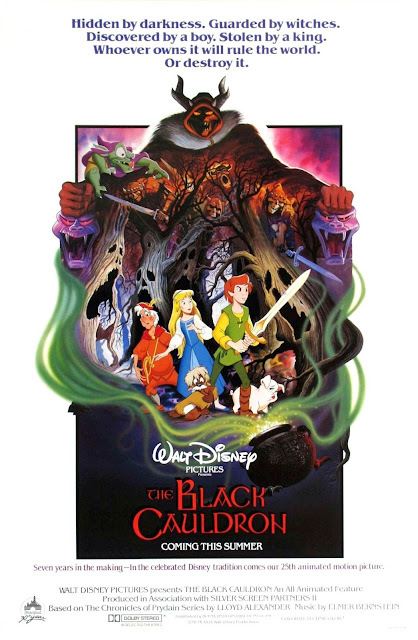 The Black Cauldron was (in)famously one of Disney’s biggest flops. It almost destroyed its entire animation studio. Without going too much into that history, I would recommend the fantastic documentary “Waking Sleeping Beauty” for anyone who is interested in learning more. The film is an adaptation of the five-book series of books, “The Prydain Chronicles” by Lloyd Alexander. I will admit I am a huge fan of the books, which probably informs my interest in the movie. To say that the books are superior to the movie is probably non-controversial. But this is neither the time nor the place for another “the book is better than the movie…” diatribe. Instead, let’s just focus on the movie itself. One of the biggest criticisms against it was (and probably still is) that it was too gory for young audiences, which earned it a “PG” rating (a Disney movie rated PG?!? Gasp!). And the villain seemed particularly dark and scary, at least by standard “Disney measures.” He was hardly seen, and had very little dialogue. Of course, like all Disney villains, he had a short side-kick who was created for the film as a possible source of some comic relief. Indeed, I may be wrong about this, but I believe The Black Cauldron was the first animated Disney film to show actual (albeit animated) blood. I would really love to know your thoughts on this movie. Was it a classic by any measure? No—I don’t think so. But I think it certainly deserves better than its initial reception." Chuck: What a great question! And this is the perfect time to remember The Black Cauldron, as it is celebrating thirty years since its premiere (or was, anyway, in July of 2015). I still remember all the controversy the film generated. 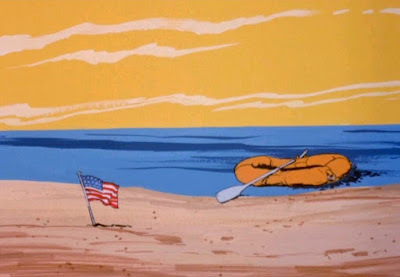 It was considered a new style for Disney, and one that, to old hands, anyway, seemed too graphic, violent and dark. I remember the debate well. Was this the future of Disney and animation? Or a blind alley? Today, the film is much appreciated by fans, but representative of a different brand of creative thinking, for certain, than the current crop of animated films. I shall take up your call to action and post a full review of this animated film tomorrow at 6:00 am. So stay tuned! 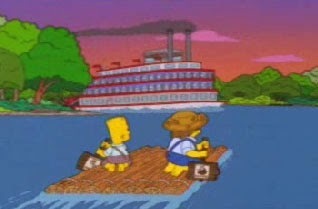 A raft is a small vehicle made for transportation over water, or in some cases, space travel. 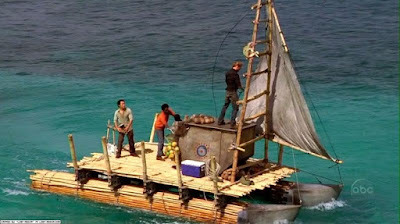 A raft features a basic design, and is often inflatable in nature. 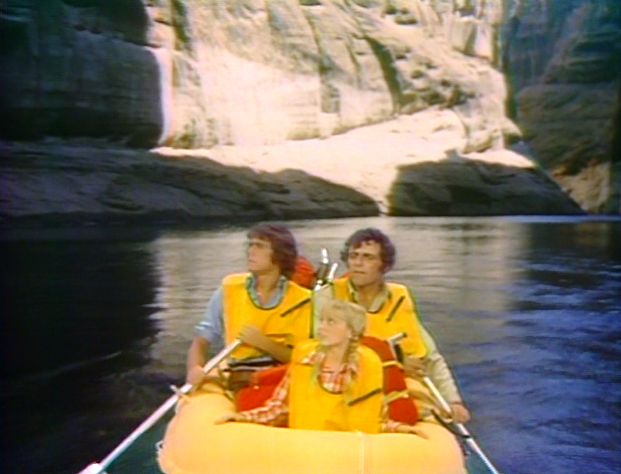 Rafts have featured prominently in cult-TV history, often serving as escape vehicles in dire situations. Famously, Land of the Lost (1974-1977) begins with an expedition on an inflatable raft. The Marshalls (Spencer Milligan, Kathy Coleman and Wesley Eure) raft down treacherous rapids on a “routine expedition” before an earthquake propels them through a dimensional gateway. 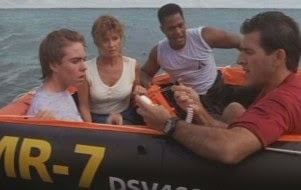 Similarly, the Butler family is rafting down the Amazon River when a whirlpool or vortex pulls their inflatable raft underwater. 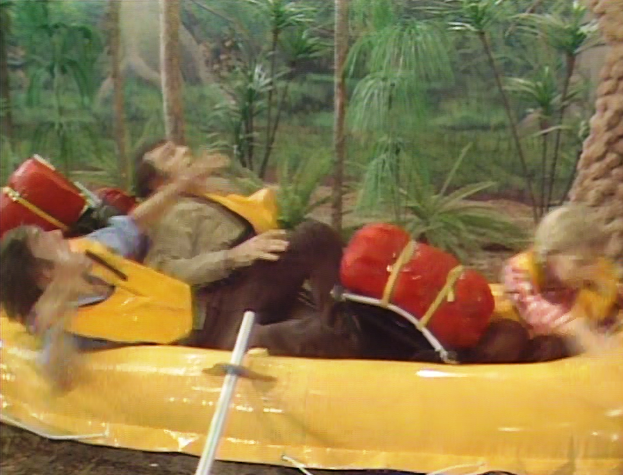 They resurface in a prehistoric world, in Valley of the Dinosaurs (1974). An episode of Hanna-Barbera’s live-action series Korg, 70,000 BC also involves a raft. 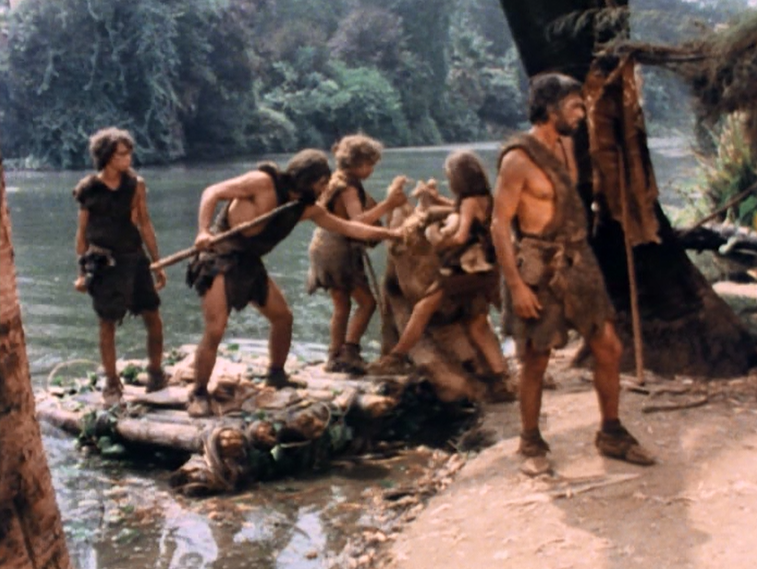 In “The River,” Neanderthal hunter Korg (Jim Malinda) must transport his family across “the wide water” (what we would call a river…) to hunt a deer. It’s a desperate need because the family is starving. 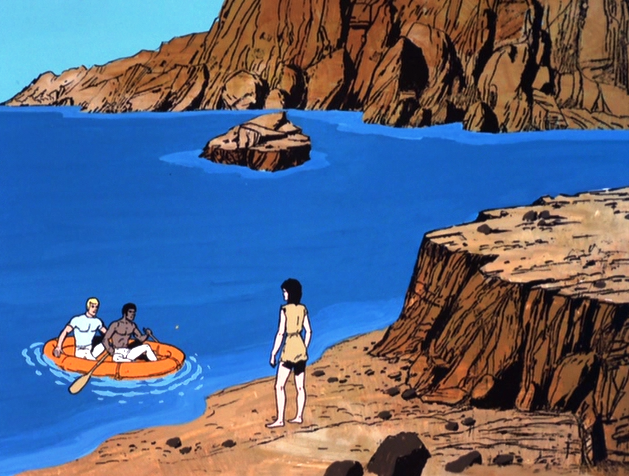 Korg’s wife, Mara (Naomi Pollack), however, believes that the water is evil and refuses to board the raft that Korg constructs with logs and vine. With survival on the line, Korg must make a tough choice. 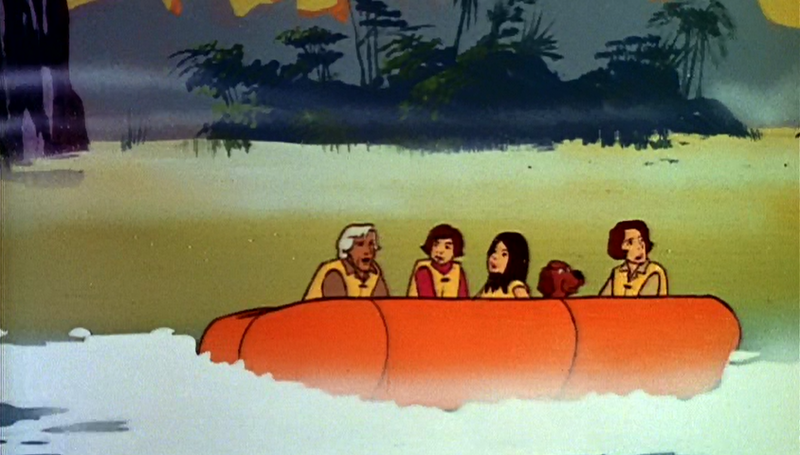 Return to the Planet of the Apes (1975) another Saturday morning series, sees crashed human astronauts use an inflatable raft to cross a narrow river in the Forbidden Zone, before encountering a society of advanced, talking simians. The second episode of Lost’s (2004 – 2011) second season is titled “Adrift” and it involves Sawyer and Michael attempting to escape the mysterious island in a man-made raft. 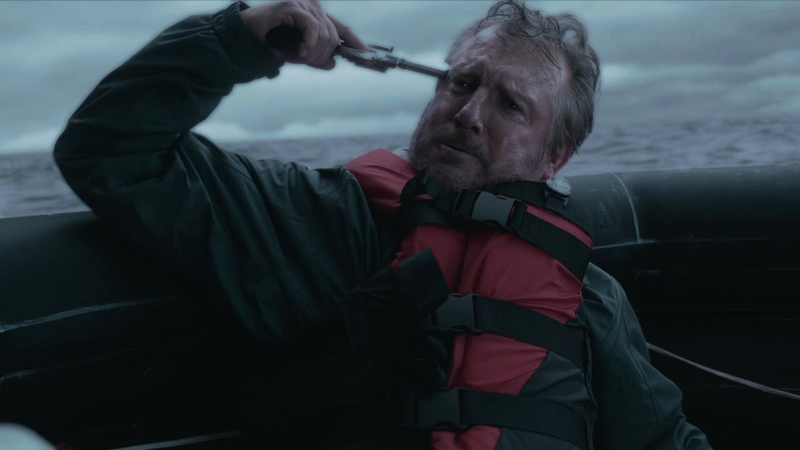 The superhero series Arrow (2012-present) also features a crucial scene set aboard a raft. 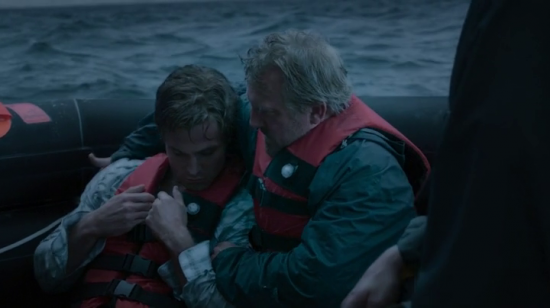 In flashback, we learn how Oliver Queen (Stephen Amell) survived a disaster at sea with his father, only to see his father take his own life, so that Oliver could survive. An unusual space craft is seen in the Lost in Space (1965-1968) episode, “The Raft.” Here, the Robinsons create a life-raft to take a passenger to another world, and possibly bring back help. 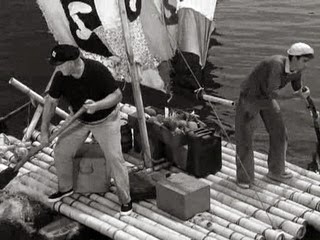 The plan goes awry, however, when Dr. Smith (Jonathan Harris) launches the raft, with only Will (Bill Mumy) aboard as company. 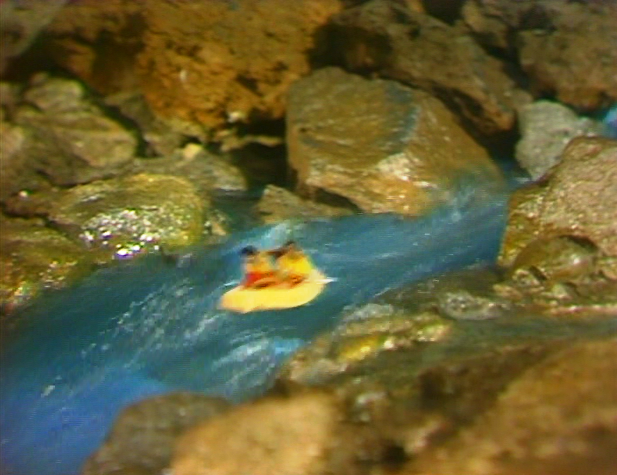 The raft re-enters planetary orbit, and is not used again in the series. Identified by Pierre Fontaine: Supercar. 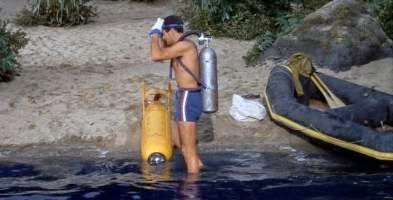 Identified by Hugh: Gilligan's Island. 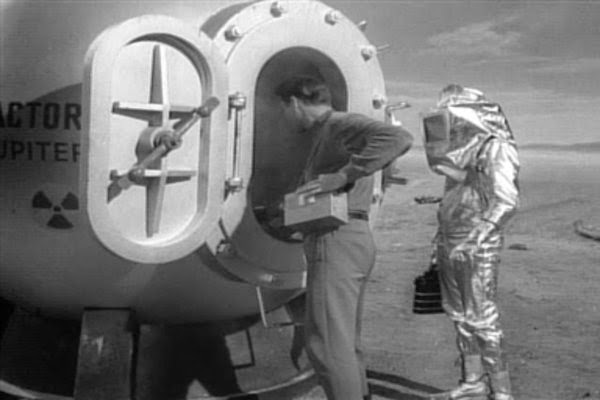 Identified by Hugh: Lost in Space: "The Raft." Identified by David Colohan: Valley of the Dinosaurs. Identified by Hugh: Korg, 70,000 B.C. 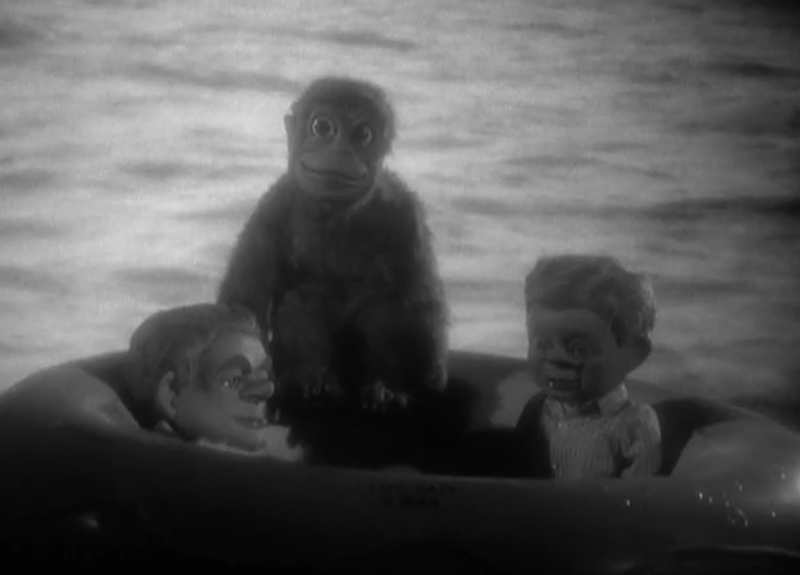 Identified by Hugh: Land of the Lost. Identified by David Colohan: Return to the Planet of the Apes. Identified by SGB: Spae Academy: "Life Begins at 300." Identified by SGB: SeaQuest DSV. Identified by David Colohan; Lost; "Adrift." Identified by David Colohan: Arrow. Lost in Space Day: "Forbidden World"
Lost in Space Day: "The Ghost Planet"
Lost in Space Day: "Wild Adventure"
Lost in Space Day: "Blast Off into Space!" 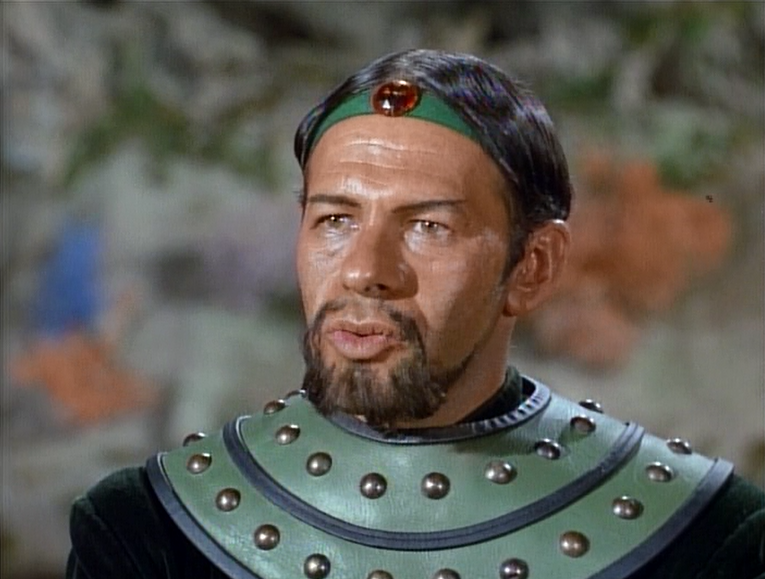 Lost in Space Day: "Follow the Leader"
Lost in Space Day: "A Change of Space"
Lost in Space Day: "The Lost Civilization"
Lost in Space Day: "All that Glitters"
Lost in Space Day: "The Space Croppers"
Lost in Space Day: "His Majesty Smith"
Lost in Space Day: "The Space Trader"
Lost in Space Day: "The Challenge"
Lost in Space Day: "The Magic Mirror"
Lost in Space Day: "War of the Robots"
Lost in Space Day: "The Ghost in Space"
Lost in Space Day: "The Sky Pirate"
Lost in Space Day: "Return from Outer Space"
Lost in Space Day: "Attack of the Plant Monsters"
Lost in Space Day: "One of Our Dogs is Missing"
Lost in Space Day: "The Raft"
Lost in Space Day: "Wish Upon a Star"
Lost in Space Day: "The Sky is Falling"
Lost in Space Day: "The Oasis"
Lost in Space Day: "My Friend, Mr. Nobody"
Lost in Space Day: "Welcome Stranger"
Lost in Space Day: "The Hungry Sea"
Lost in Space Day: "Islands in the Sky"
Lost in Space Day: "The Derelict"
Lost in Space Day: "The Reluctant Stowaway"
Happy Fiftieth Anniversary, Lost in Space! Ask JKM a Question: What Else is Out There?